Hello all! Ok, I'm heading to Moab next month for the first time in my '08 Unlimited X, and I'm taking the wife and kids. She's stock except for 33's BF Goodrich A/T KO2 that I put on last week (was impressed at how they did in the snow this weekend!). I'm a newbie but can't wait to get over there and play around some! I've done a few trails in Idaho Springs area of CO, last Fall, but I'm ready to play on some red rock now! What trails do y'all recommend for a "first timer"? I know Jeeps are amazing machines, but what are some fun trails that my little stocker can handle? Any advice and recommendations are appreciated. Tusher tunnel is pretty cool. Thanks to all those that have served and are still serving protecting the freedoms we love. White Rim Trail is awesome, and easy. It's long, but can be done in a day...if you pack a good lunch and watch your fuel gauge. @Wayne , I had seen some stuff about Hurrah, and that one is on my list to look at more closely and I will have to check out Tusher Tunnel! @Prages , I've heard White Rim is pretty much an all dayer. We will spend 2 full days there so maybe we can take a day for that one. Is it true that a stock Jeep can handle Fins and Things? Hey Tony, we did Moab last summer for the first...be prepared to be knocked out! The place is magic. I can only speak from my own experiences there. Our first run was Spring Canyon Bottom. I selected it from the Charles A. Wells trail book. If you don't already have a copy, go on Amazon and order one. It's filled with maps, pictures and most importantly trail ratings. We wanted to get our feet wet on some not too challenging trails to start with. You can see pics and read a report I posted in my build thread starting at post # 618, pg. 21. 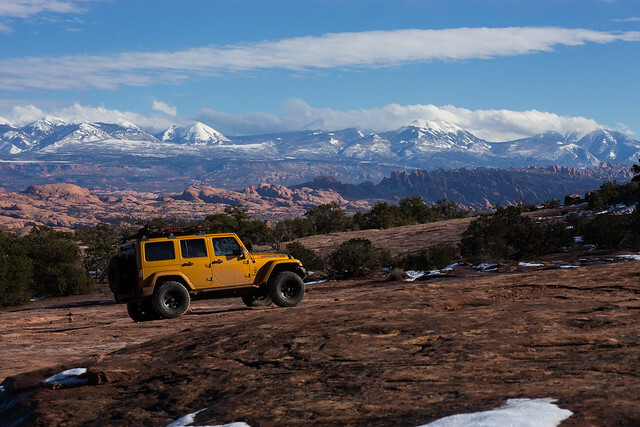 You're going to love Moab, be sure and head out to see the Canyonlands National Park. If you can go either at the beginning of the day or the end, the light is spectacular for picture taking and human enjoyment! Hit me up with any questions you might have. Steeljag, TRBOKEV, HyeClmr and 1 others like this. We did it in a pretty much stock rental and it took us about 12 hours (taking a few side trails), but driving the Jeep like a rental...my wife thought it was a race. It's definitely an all day trail, but like I said, it's an easy trail. Most, if not all, could be done in 2wd. Here's a video from when we did White Rim. definitely get that book by Charles webb. It also gives you turn by turn direction using your odometer. We did Moab for 2 weeks this past fall. Took a stock 2001 TJ with 2" body lift and 31x10.5 KO2's and Smittybilt 9.5k winch w/ straps. Open front and rear diffs. Got the book! Arches NP back side 4x4 trail - really cool. Only issue was on Top of the World. Had to which up one set of ledges. Take your time and pick good lines. Full tank to start out. Lots of water. drrags, dpierres, RasTrent and 2 others like this. 2001 Sport, 4.0, 5-spd, Maroon, 2" Body Lift, Front Spartan Locker, Soft and Hard Tops, Winch, Roof Rack. Awesome pic Cougarkid!!! I can see that Moab will have to be a regular thing for me! There are sooooo many awesome trails to go check out! Another vote for the book by Charles Webb. But a word of note about the book, the trail ratings are conservative. The green trails are super easy. The blue trails can be done in pretty much any SUV. The red trails are "Jeep" trails. You have to read the notes to see how hard a Jeep trail it actually is. Or search other sites for better rating info on a given trail. That said, we went to Moab for the first time last fall and the book was great. We started easy, doing LaSalle Pass. In the middle we were doing Chicken Corner. By the end we were doing red trails in our stock JKU BC. And we are new at this. In hind sight we wish we had been more aggressive with our trail picks. We did not do Fins and Things, wish we had. Others on the list for next time include Rose Garden (only did part of it this time), 7 Mile Rim, and Wipe Out Hill (the trail, not the hill). We also did some trails in southwestern Colorado, like the Alpine Pass loop. It was truly an amazing trip. The way I look at it, if I'm not feeling the excitement and nerves, I might as well just stay on the dirt roads around my house! n3tfury and JK4HER like this. @GuzziMoto , SW CO has some amazing trails. We rented a JK down in Ouray a couple years ago, and that is where I kind of got hooked on the Jeep adventure! I moved from FL (flat land and mud swamp) to CO back in 2010 and I'm always looking for new places to go and see that are off the beaten path! I figure since Moab is "just over the mountain" from Denver, it's a place to go see and experience! I'll be there April 20/24. Last year's trip got me hooked. Getting rig ready. Get the books, the Moab Visitor and information center has both the Well's and Massey Moab trail guides for sale. The White Rim is a must do. 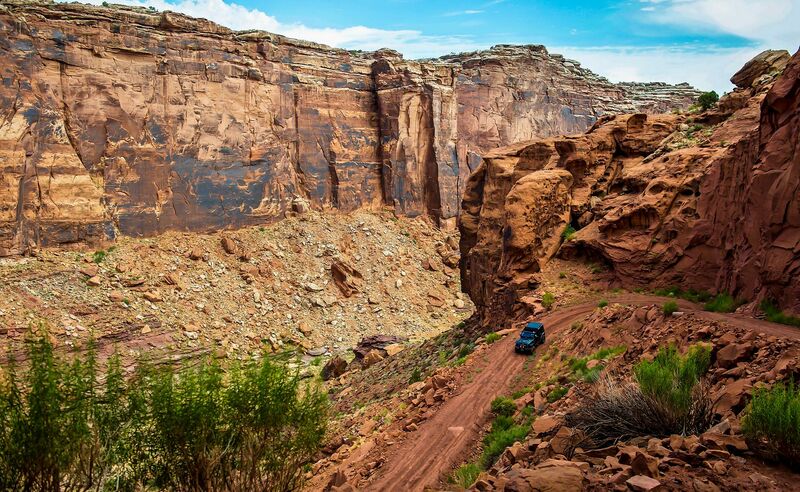 It is not a difficult trail unless you meet another Jeep on a ledge roads- someone is going to have to back up. Get an early start and it is doable in a day, however the Park Service now requires a permit, check out the Canyonlands web site for regs and road conditions. Have fun. We are going to Easter Jeep Safari, reservations made today! Our first time so were stoked! I'm glad you mentioned that about the Park Service requiring permits because I had no idea about that! Im headed back end of April. Going with guys on ATV/UTVs. Going to be a fun time thats for sure. Youll definitely want to go back. Tusher Tunnel trail is GREAT. I picked this mag up in Phoenix at Desert Rat and started reading thru it. Awesome trail reviews and trail ratings. Describes Jeep capabilities, which many trails can be done by stock vehicles with 33" tires. Looks like a ton of fun and I will be out there the week of this event for a business trip. If I partake, I will need to rent a Jeep. I decided against driving my Jeep out from Ohio. Not sure I want to put the wear and tear on it. I have yet to look into renting a Jeep. Does anyone have any recommendations on who to rent a Jeep through? And is there a limit of days you must rent. I'd be fine doing one day. I've been to Moab on mountain biking trips so I'm familiar with the area. 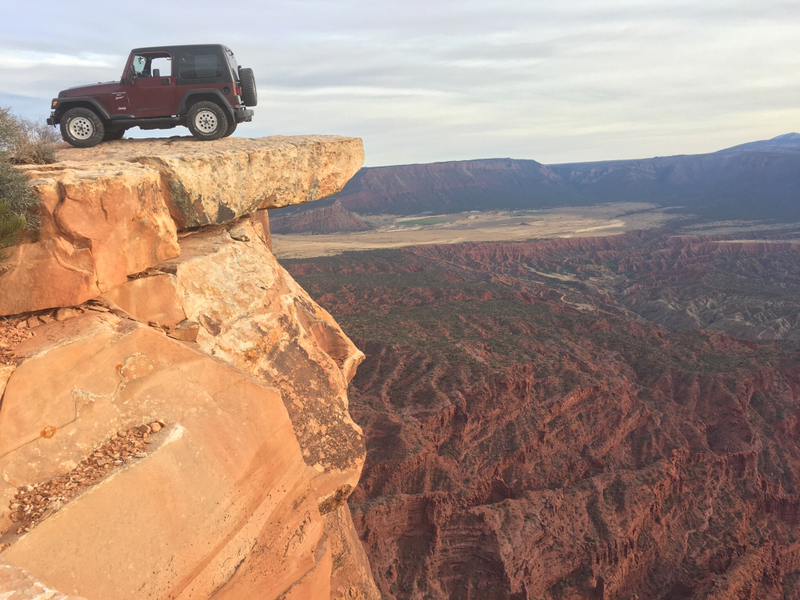 Porcupine Rim on a mountain bike is amazing, so I'm sure in a Jeep is as much fun. Lasal Mountains. I took Long Canyon back down to town. Fins & Things was my 3rd trail. Even then, it was way high up on the pucker factor for me! It does have a lot of by passes around the more difficult parts. I would recommend doing it with someone...you'll want a spotter. Are you lifted, 35's? You'll need some clearance for some of the climbs/descents. The Alpine Loop trail we did was east out of the south side of Ouray. It went up through Engineer Pass. Amazing. There is another book in the same series that covers Southern Colorado. It has those trails and more in it. Fins and Thing is trail 43 in the version of the book I have. It is east of town. It is not what I would call an easy trail from what I have heard, but at least a few say you should be able to do it in a stock Jeep Wrangler with descent tires. We wish we did it on the first visit. Part of the reason we didn't do it was not having someone to do it with. Having at least one other Jeep with you would be a good idea for any harder trail. But you gotta do what you gotta do. But I would do at least a couple easier trails first. I think there are some spots Jeepers meet up at in the morning before heading out, you may want to see if you can join up with others, if only for the harder trails. With only two days, I'd pass on the White Rim. Great trail and can be done in a day, but should be done with an overnight stay. Like others stated, get Charles A Wells book. Plan your trails ahead of time and you can easily do three,four five trails each day without rushing. A lot of trails are connecting trails. These can all be done in a stock vehicle. Just take your time and enjoy the views. Don't be afraid to air down and disconnect your front sway bar. We'll be heading back the end of May for eight days, three of them alone will be spent on the White Rim. Take lots of water/food. Many of the trails, we didn't see a single person/vehicle. So be prepared if something happens (breakdowns do happen). Keep an eye on the kids, it truly is a magical place, but can turn bad very quickly. @CAJW mine is stock height as well, and I'm either feeling pretty optimistic, or pretty stupid, but I think I am gonna try Fins and Things!!! A buddy of mine did it last fall in his stock 2 door JK. He says it should be fine with mine. I'll probably scrape a bit, but as long as nothing wet comes out the bottom, I'll be happy. He told me to expect some anxiety and heart pumping, but said his made it. The only times I've ever gotten in trouble was when I was having fun! Thanks for this. My book (pub 2014) has trail #43 listed as Valley of the Gods Trail, with no mention of the Fins trail that I can find. The Moab regional map doesn't show it east of town, but when I get there, I'll try to find someone to follow out there to check it out. My plan is as you mentioned, easy trails first then we'll start upping the fun factor. Will probably do the trails Tony mentioned to start out with. Tony, thanks for this info. Fins is now on my list, but I'm going to get that engine skid plate ordered and a blindfold for the wife!